#8 "Hordes - New Warlock Tactics, Scrutator and Exemplar Classes"
Isn't it time those uppity Sulese learned their place? Cygnar, Khador and Cryx think so. 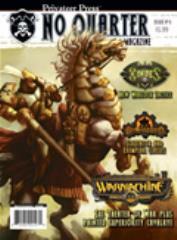 Bring down the walls of Sul in this 4-player Theater of War campaign for WARMACHINE. If you're the "burn them all and let Menoth sort them out" type, let's just say it's gonna be your kind of party. Did you ever wish for a pony? Us neither. Except maybe an undead one with steam-powered necro-mechanical tubing and a pair of soul-rending blades.Who says wishes don't come true? "Mercy? You wanted mercy? I'm Lawful Neutral!" Are you willing to go to any length to see Menoth's will be done? It's what you've been waiting for: the Knight Exemplar class and the Scrutator prestige class for Iron Kingdoms role-playing. Get off your wrack and read this article, heretic! Ready for the new wave of warlocks to hit the tabletop? Learn how to totally own your opponents with our tactics guide for using the next wave of warlocks at the 1000 point level. Building graveyard terrain, exploring Five Fingers' South Shore, modeling an entirely distinct Knights Exemplar army, and the inside scoop about the Privateer Press paint line, Formula P3. Oh, and get schooled on an Iosan secret by Pendrake's elven assistant.